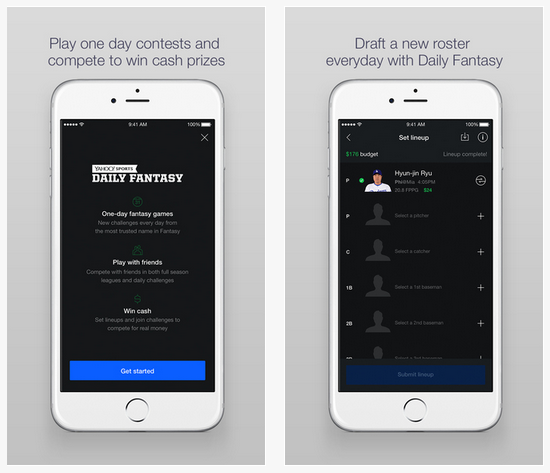 Yahoo now hosts daily and one-week fantasy sports games, one of the most popular activities on the Internet, with an estimated 57 million fans in the U.S. and Canada. Yahoo, similar to other online destinations, has long hosted season-long fantasy sports but the daily segment has grown rapidly in the last two years. Yahoo stands to make hundreds of millions in new revenue, say analysts. Two companies dominate the category: FanDuel and DraftKings, which are now drawing interest from big name investors. Fantasy sports are all about data, and technological advances allow them to make “a nearly infinite amount of information available instantly and for sale,” reports The New York Times. Fantasy sports are exempt from the Unlawful Internet Gambling Enforcement Act of 2006 by being deemed games of skill, the result of lobbying by the National Football League and other professional leagues. Eilers Research estimates that daily games will generate around $2.6 billion in revenue in 2015, soaring up to $14.4 billion by 2020. Research by Ipsos for the Fantasy Sports Trade Association reveals that participants spend an average of $465 a year on contest fees and materials; contest fees range from $.25 to $1,000 and prize pools range from $54 to $100,000, with a few offering $1 million or more. Both FanDuel and DraftKings are valued at $1 billion, although neither company is profitable. FanDuel has raised $88 million from investors including Comcast, NBC, KKR and Shamrock Ventures. Atlas Ventures, Redpoint Ventures and others have put $76 million into DraftKings. The National Basketball Association is also invested in FanDuel, and Major League Baseball with DraftKings, which also has an exclusive deal with ESPN. Eilers managing director Adam Krejcik reports that, last year, the two companies spent a combined $100 million. “This year, each will spend that amount on marketing and advertising,” he notes.